Former colleagues met to commemorate a regional daily journalist 10 years on since his death at the age of 52. Around 30 journalists and friends gathered at the Combermere pub, in Wolverhampton, to remember Andy Donkersley, best know for a 20-year stint on the city’s daily title the Express & Star. 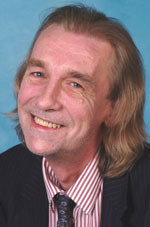 Andy, pictured, was found dead at his home in Shifnal, Shropshire, in November 2008 after a 30-year plus career which also saw him work the Derby Evening Telegraph and Blackpool daily The Gazette. Former E&S reporter Paul Gibbons had suggested the evening to ex-E&S sports editor Steve Gordos as a 10th anniversary memorial. Said Steve: “It says much for the respect and affection that we have for Andy that we should still wish to remember him 10 years on. West Midlands freelance journalist Jon Griffin, who worked with Andy for many years, said: “Andy was a true friend, as well as a first-class reporter. A collection raised £80 and was handed to the Rev Paul Hinton, of St Hilda’s Church, Warley Woods, who had also worked with Andy on the E&S. A collection after his death paid for memorial bricks installed in the name of Andy and his late father Harry at the home ground of his beloved hometown football club, Huddersfield Town, now called the Kirklees Stadium. Steve added: “Andy refused to use the sponsor’s name and always referred to it as New Leeds Road. At the time of his death they were in the third tier of English football – now they are in the Premier League.